The Stone Barn is located on 35 acres in the rolling hills of western Wisconsin. 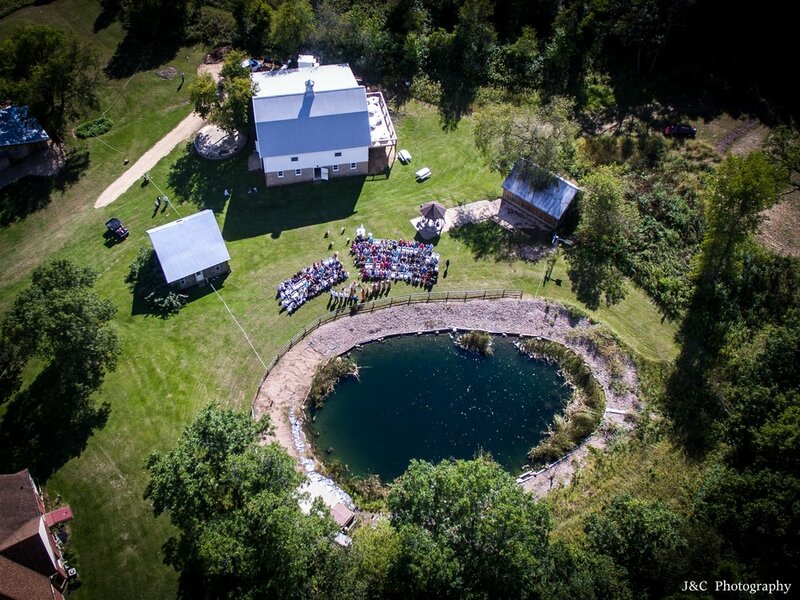 Our property boasts a beautiful pond, lawn, forests, and various outbuildings that will provide the perfect backdrop to your celebration. Restoration to the wedding barn was completed in the fall of 2015. Our detailed renovations provide our guests a unique and rustic ambiance. Our property is also home to the famous Stone Barn pizzeria, which offers a variety of Italian-style thin crust pizzas. We can work with you to host your wedding rehearsal and dinner upon request. We understand how special this day will be and will do our very best to make it both a relaxed and memorable one. Contact us today to arrange a tour or discuss your reservation. We are unique in that we only make one reservation per weekend. Our approach allows you to slow down and enjoy your experience. You can arrive the day before to set up and decorate and leave knowing everything is perfect. On your wedding day you will have full access to the wedding barn, lawn, and gazebo from 9:00 a.m. until midnight. You can host up to 200 guests and we furnish the tables and chairs. Some couples choose to clean up and check out the night of their wedding, but you have the option of returning the next day before noon. The barn is ready to accommodate the caterer of your choice. Updated facilities include industrial sinks, full-size refrigerator, and preparation tables. We can provide you with a list of local caterers, bakeries, florists, and lodges. We have two beautifully restored restrooms that couples often choose to use as preparation rooms. The electrical system has been updated and is ready for a live band or DJ. The spacious ballroom has a beautiful wood floor and is perfect for dancing. Alongside the dance floor is our sleek built-in bar. We provide two bartenders to serve beer, wine, and liquor. Access to the barn and property can be arranged ahead of time for engagement photos and your wedding rehearsal. Please contact us for pricing and to schedule a tour. Thank you for considering us for your wedding.